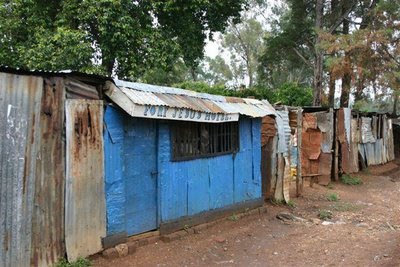 KENYA EME DXpedition from ki79mo - Call : 5Z4EME. 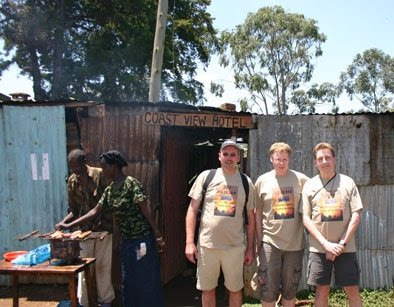 The team of Rene, PE1L, Eltje, PA3CEE and Ronald,PA3EWP is meantime qrv from Kenya (5Z4) from locator : KI79MO. 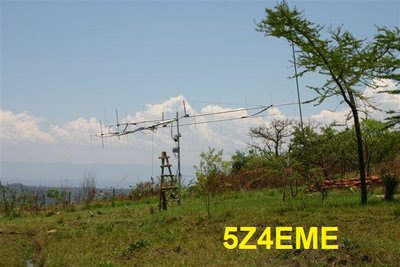 I had a contact with the team from Kenya 5Z4EME 2m EME at 1 of April 2009. Until today they have worked 218 stations. This is a very high score for portable EME operation despite of regular power failure, giant thunder storms and varius other problems. The antennas are 2X10 elements cross with about 400w of power. 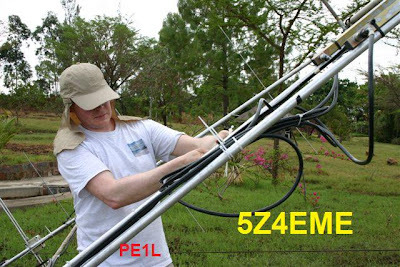 In this foto Rene, PE1L working in the antenna set-up. And here we have the EME dxpedition team in front of their (5 stars) Hotel and Restaurant. The DXpedition to Kenya ends at 14 of April so, look for the 5Z4EME on 144.124 1st seq as soon as possible and if you have 70 cm they are also QRV on 432.084 with a single yagi 23 elements and 100w always in WSJT. 73, thank you and wish you a safe come back at home de SV8CS.